This full-day trip is the foundation for your ocean paddling skills! We will extend what we learned in Introduction to Kayaking by covering more boat-maneuvering skills (especially utilizing edging to make our boats turn faster), bracing skills, and rescue skills (including self-rescues and Eskimo rescues). Since we are venturing onto the ocean for the first time as sea kayakers, we will also discuss such ocean-specific issues as basic navigation, rules of the road, flares and signalling, and VHF radio usage. And finally, we will teach you skills to deal with the sea kayaker’s biggest adversary: wind. We’ll also get to do plenty of paddling between our instructional sessions. The trip is held at a number of locations, including Gloucester, Marblehead, and Cohasset, and the location of your trip will be decided by the guide depending on weather and tide. This trip is designed for those who have taken our Introduction to Kayaking or an Introductory Trip, or have the equivalent experience. 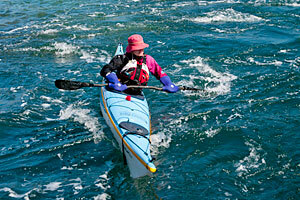 Paddlers should be able to perform assisted rescues and paddle five miles over the course of the day. Follow up with our Rough-Water Skills Trips. Ocean Skills Full-Day Trip meets at the Newton Historic Boathouse and we'll travel by van to the destination. Formal introductory instruction, like our Introduction to Kayaking, Introductory Trip, or equivalent. Ability to paddle 5 miles in an outing.